My reason for going back and rereading this text (originally published by Judson Press, 1950) was in conjunction with some study on the history of revival in America in the last two centuries. Torbet has an interesting chapter (8) on the division of Baptists after the Great Awakening into “Regular” and “Separate”. The Great Awakening divided Baptists over the amount of emotionalism that should be allowed in calling men to repentance as well as whether “invitations” should be used at all (especially an issue in the days of Finney). The issue took on a Calvinist/Arminian bent as time went on. 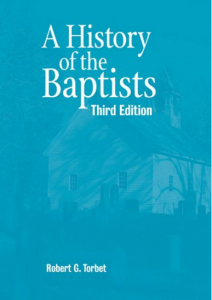 Also of interest was the history and purpose of Baptist Associations throughout the eastern states and the history of the “Camp Meetings” in the west. Description is also given of “covenant meetings, a subject being renewed in our own day.